Giving a whole 'nother dimension to that common belief that you shouldn't smoke and drink the same night (*cough* BS *cough*), Gracias Madre in WeHo is SMOKING COCKTAILS IN BONGS. 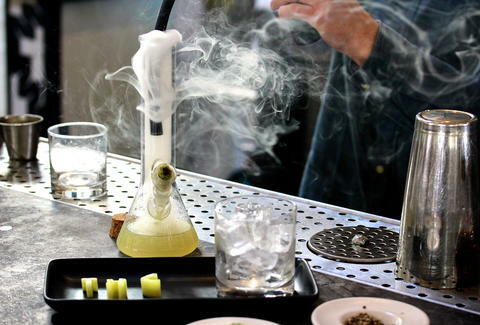 This newly added drink called the Up in Smoke includes tequila blanco, house Mosaic-hopped cucumber soda, lemon, celery bitters, and CO2, all of which is smoked with hempseeds... in a bong -- or as it's described on the menu "a water pipe decanter." Unfortunately, you can't take a hit yourself: they'll set the whole thing off with a PolyScience culinary smoking gun, which is totally fine, because you're gonna be hitting those chips and salsa anyways. 'Cause you've got the munchies. Right?